The modern craftsman entertainment collection marries a traditional, multi-step distressed oak finish on poplar solids and oak veneers with new age, brown metal accents. 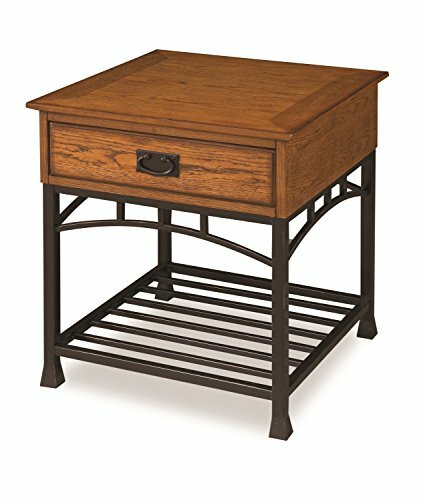 The modern craftsman end table offers one storage drawer and an open storage shelf. Easy to assemble. Measures 22-inch width by 22-inch depth 24-inch height. Comes in an distressed oak finish.pin holes are part of the distressing.This technique (warm hole) is done by hand in our factory.